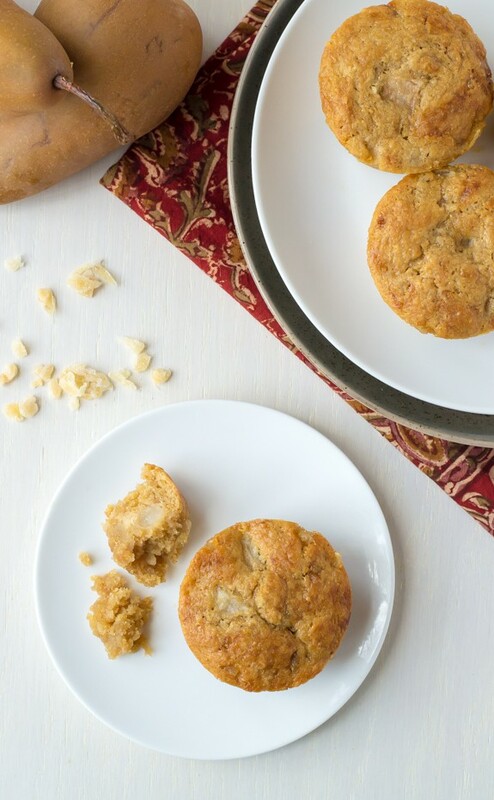 Pear Muffins with Ginger are that beautiful moment when you find five dollars in your washing machine or rediscover a forgotten shirt lurking in the back of your closet: freebie jackpot! The old is new again. Fear not—I’m not walking around with pear muffins stuffed into my jeans, Napoleon Dynamite style. I also don’t intend to tuck a muffin behind my rack of plaid shirts for a midnight snack. Rather, these moist, healthy muffins are the result of a recent jackpot (re)discovery in my life, pears. I have Ben’s Nonna to thank for reintroducing me to the sweet, juicy fruit at breakfast, when Ben and I were visiting a few weeks ago. I took a bite of the most sublime Bosc pear and realized that I’d been unconsciously overlooking one of fall’s loveliest offerings for the past several seasons. Every year, I go ape on apples—apple bars, apple cake, apple soup, apple dip, apple meatballs (I could go on)—to the extent that I’d all but forgotten the poor pears. Shame on me. I’ve been making up for lost time by eating a pear a day for the past two weeks, and while I’ve tried a few different varieties, Bosc are my favorite. 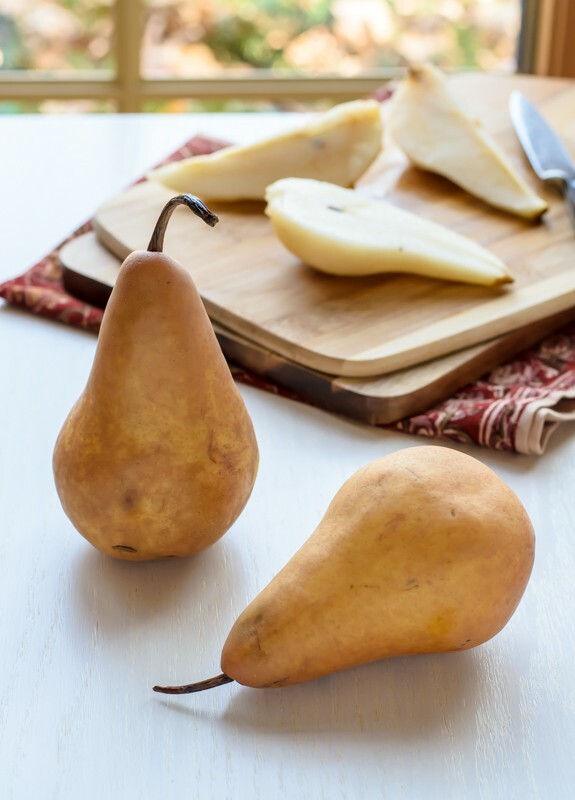 They are affordable, lightly spicy and sweet, and best of all, super easy to distinguish when ripe, a quality to where not all pears are created equal. Wait for your Bosc pear to be lightly soft but still firm, mildly fragrant, and especially yellowy, brown, and (forgive me, pears) kind of ugly. Initial pear binge complete, I figured it was time for me to actually bake something with them. That “something” turned out to be three consecutive batches of Pear Muffins. Ginger is a perfect pear pairing (pun both terrible and intended), so these muffins pack it in three ways: fresh, ground, and candied. The ginger flavor is dynamic, but doesn’t overwhelm the delicateness of the pears. I’m a believer that a muffin should be a muffin and not a cupcake—when I need a Salted Chocolate Olive Oil Cupcake, I’ll reach for one, thankyouverymuch. Made with very little added sugar (the pears provide most of the sweetness), Greek yogurt, coconut oil, and whole wheat flour, these pear muffins are decidedly healthy and belong squarely breakfast category. These muffins also contain borderline-irresponsible quantities of diced pears. I squeezed as many as I could into the batter, and although the extra fruit does make the muffins less fluffy than you’d see in most bakeries, the muffins are also insanely moist and tender because of the extra fruit. Plus, unlike the majority of bakery muffins, these little cuties are actually good for you! With wishes for extra money in your jeans, fun finds old and new, and a happy, healthy breakfast: Pear Muffins with Ginger. Pear muffins spiced with three types of ginger: fresh, candied, and ground ginger. 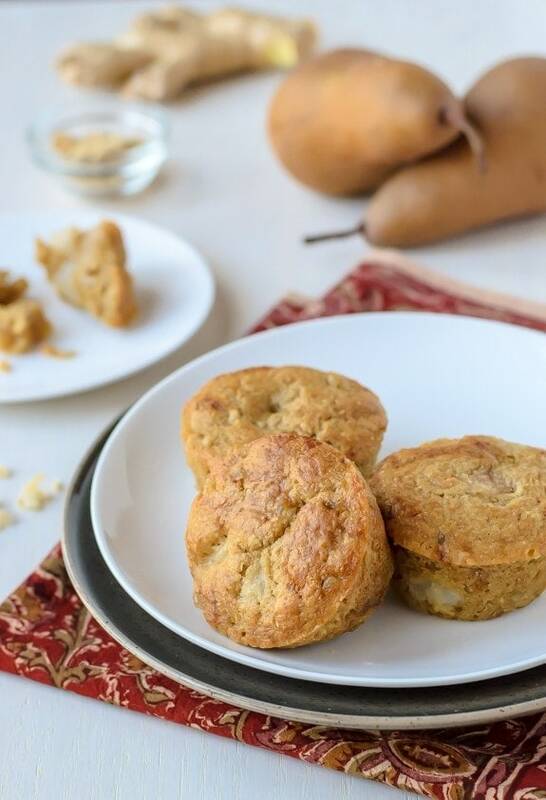 Made with loads of fresh pears, whole wheat flour, and Greek yogurt, these moist, tender muffins are the perfect healthy way to begin your morning! Place rack in the upper third of your oven and preheat to 400 degrees. Lightly grease 12 standard muffin cups or line with paper cups. In a large bowl, whisk together the egg, granulated sugar and brown sugar. Once combined, stir in the melted, cooled coconut oil, then the Greek yogurt. 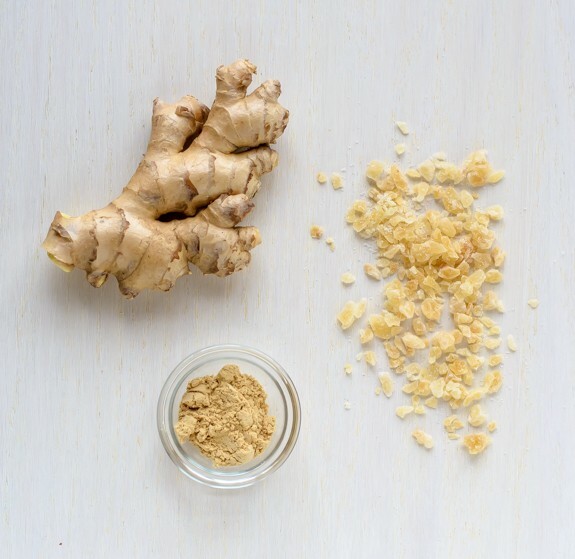 Grate the ginger directly into the bowl along with any juices and stir again to combine. In a separate medium bowl, stir together the all-purpose flour, white whole wheat flour, ground ginger, baking powder, baking soda, nutmeg and salt. Add all at once to the wet ingredients, stirring by hand just until combined (do not over mix!). The batter will be very thick. Gently fold in the pears and crystallized ginger. Scoop the batter into the prepared muffin cups. Place in oven, reduce heat immediately to 350 degrees F and bake for 23 to 27 minutes, until the tops are nicely golden and a toothpick inserted into the center of a muffin comes out clean. Set the pan on top of a cooling rack, then allow muffins to cool in the pan for 15 minutes. To remove, run a butter knife around the edge of each muffin, then gently lift from the pan with a fork. Public service announcement: Next week, I’ll be heading to Chicago for a special experience at the Aldi test kitchen. I’m excited to have time with Aldi representatives, including Sensory Expert Gail Vance Civille and Master Sommelier Leslee Miller. Are there any questions you’d like answered? If yes, feel free to send them my way in advance, and I’ll be sure to report back after the event. I TOTALLY agree about pears… there are so lovely and regal and juicy and delicious! This is a beautiful recipe girl! Regal is the PERFECT word to describe pears Amanda! You are a poet. Erin, I love love love pears. . especially poached pears. . love that you made these muffins with ginger. . love ginger so much!! beautiful muffins!! After a long time separation from pears (I had it in my mind that I was allergic. I am not) I now have a new found obsession with them, and these are the perfect way to feed it. Loving all of the ginger and fruit goodness in these babies!! I love pears too, and we’ve been buying a couple a week but I do tend to overlook them and grab an apple when I’m looking for a snack. I need to remember to eat those pears, and these muffins look like a great way to do that. I love the healthy ingredient list! I’ve been binging on pears this year too! I think they get a bad rap because they are always like rocks when you buy them at the grocery store. But I’ve learned to be patient and let them ripen! These muffins look gorgeous! You know, I never think about baking with pears. You’re so right! Love the tater tots in the pocket reference, by the way. And muffins are NOT cupcakes! These are a perfect muffin. Love the idea! Mmm mmm mmm! Pear and ginger is a stellar combination. And I love that you use 3 types of ginger in these. Go Pears! I love pears but always forget about them. Clearly this is a sign to get back on the pear bandwagon. Oh, and have fun at Aldi!! I totally wouldn’t mind if you walked around with some of these pear muffins in your pocket…maybe I’d be a pick pocket and steal one, just sayin’! These look absolutely delish girl, I’m totally a pear lover too, so I’m just itching to get into the kitchen and make these! I agree, pears are totally underrated! I attempted to make pear muffins last year and ended up with two big fat fails. I gave up, but your recipe may be enough to help me face my pear muffin fears! I literally don’t think I’ve ever bought a pear. I may need to change that, I love great new muffin recipes! Anna, run out and buy some right now! They are absolutely lovely. I always forget how much I like pears, until I’m forced to have one. And then, it clicks again, that oh wait, I really like pears. I’ve never baked with them, but these look delicious! Love the coconut oil, too, one of my favorite baking additions! Pears are the best, and there is still so much time for pear lovin’. Have you noticed in some fiction books they always mention one character or another saving food in their pockets. What gives? Maybe my jeans are too tight, but that would NOT work out for me. These muffins though… they are working just fine! Your jeans comment cracked me up! Maybe we should wear cargo pants so that there is more space for toting our snacks, lol. pear and ginger together sounds heavenly!!!! i completely agree with you on the pear issue! i made a pear crisp last fall–heavenly! I love pears but always seem to overlook them because of apples! Silly me. These muffins sound completely delicious! I would totally stuff these pear muffins in my jeans! I made the most amazing pear bread last winter and was just craving it! I”ll have to whip up some of these muffins too! Pears and ginger.. definitely great combination! I love them together too! Thank you so much. The only think that my man-friend knows how to cook are pear and ginger muffins. I’m going to have to give him this recipe to try next time! I wish I had found one of these muffins in my jeans this morning. I love the flavor combo! And ginger 3 ways?! Yum! Hubs: Do you have a pear recipe on your blog? Hubs: Don’t you think that’s a problem since it’s called Saucy PEAR?? I am off to rediscover pears as well. Maybe I’ll start with these just to get the juices flowing again – they look fabulous! Yummm, I love me a good, healthy muffin that fits solidly (and only) into the breakfast category! Love that you’re calling out the often underrated pear too! Grandmas always know best, don’t they? I love pears but sadly haven’t made anything with them this year yet. They seem to get lost behind all the apples and pumpkins. I have to fix that with a batch of these muffins, they sound amazing! I love pears! But sadly I do forget about them as well – poor pears. These muffins look perfect for fall, and for my upcoming Sunday brunch! Made these muffins yesterday to have with dinner – they were so good! When you mentioned that the batter would be very thick, you weren’t kidding! What I did was don a pair of latex gloves and mix them by hand. It worked perfectly and was easy to get the batter into the pan as well. We actually had them with a vegetarian chili and they went very well together. Chris, I’m so glad to hear you enjoyed the muffins! Thanks for sharing the hand-mixing tip and for taking the time to leave this great review!